Permission Denied. You're not allowed to access this page. To correct this error, you simply need to add permission to your admin access account in order to use the ebay integration. This will take you to the permissions screen for the user account. (it's located at the very end of the Plug-Ins block. Click the "Save" button at the top right of the page to commit your changes. 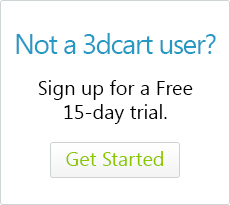 You should now have the necessary permissions to use your 3dcart store's eBay Integration and list items accordingly.